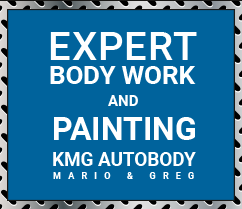 KMG AUTO BODY specializes in „Fixing the Customer” not just the car. This occurs when quality repairs are completed by our certified and trained technicians, while the customer concerns about the entire process are answered by our staff. At KMG AUTO BODY we do more than provide a good product (i.e. service repair ) we also stimulate customer awareness about the auto body repair process. This is accomplished by providing customers with educational material explaining the basic steps in vehicle repair. We pride ourselves on being straightforward and honest. We communicate very well with our customers, employees, and insurance companies. We believe in taking care of our mutual customers in a complete manner, not only making sure they receive a quality repair, but dealing with their emotions and concerns about the condition of their vehicle. We give them confidence in our ability to restore their vehicle to pre-accident condition. To insure this we follow up with a phone call to every customer to ensure they are completely satisfied with the repair. This has proven to be very effective. If you need collision repair for your vehicle, come to our shop for auto body repair, and windshield replacement. In business KMG AUTO BODY provides professional repair service for your car or truck that has a cracked window, dents, or major collision repairs. Whether you want us to touch up your vehicle with superior paint service or refinish any part, we provide guaranteed bodywork and service for your vehicle. Discover honest and courteous professionals at our body shop, where we make your car look like new again!